Crop Nutrient Balance More on this topic. Only a few decades ago, optimum plant nutrition involved applying more P than crops removed. In recent years, applications have come much closer to balancing removals. This trend has positive implications for both crop productivity and water quality. In the western Lake Erie watershed, crop nutrient removal of phosphorus, on a per acre basis, has increased over the period 1987 to 2012 (Figure 1). The increase in removal arises from growth in crop yields. While the input of phosphorus as fertilizer and manure was higher than crop removal in 1987, it has rarely exceeded crop removal since then, and has several times fallen considerable short, particularly in the years 2009 and 2011. The observed trend of increases in dissolved phosphorus in the Maumee and Sandusky rivers, from 1995 to 2013, is not explained by the trend in the phosphorus balance. Figure 1. 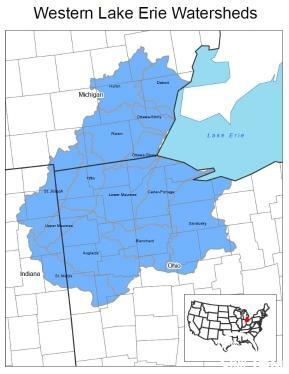 Phosphorus balance for the cropland of the western Lake Erie watershed. Outputs (crop removal) are placed in comparison to the sum of inputs (recoverable manure and fertilizer). Based on census data from 1987 to 2007, and annual USDA-NASS data thereafter. Data from NuGIS, 2014.